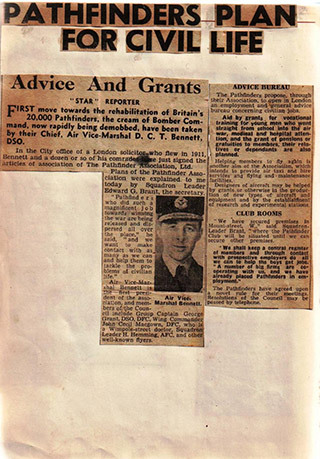 First move towards the rehabilitation of Britain’s 20,000 Pathfinders, the cream of Bomber Command, now rapidly being demobbed, have been taken by their chief, Air Vice-Marshall DCT Bennett, DSO. 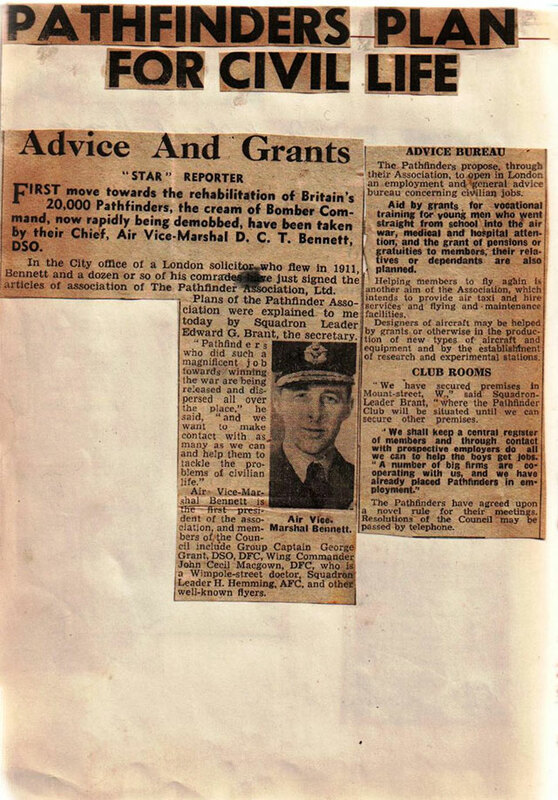 Air Vice-Marshall Bennett is the first president of the association and members of the council include Group Captain George Grant, DSO DFC, Wing Commander John Cecil Macgown DFC who is a Wimpole Street doctor, Squadron Leader H Hemming AFC and other well-known flyers. The Pathfinders propose, through their Association, to open in London an employment and general advice bureau concerning civilian jobs. Aid by grants, for vocational training for young men who went straight from school into the air war, medical and hospital attention, and the grant of pensions or gratuities to members, their relatives or dependants are also planned. Helping members to fly again is another aim of the Association, which intends to provide air taxi and hire services and flying and maintenance facilities. Designers of aircraft may be helped by grants or otherwise in the production of new types of aircraft and equipment and by the establishment of research and experimental stations. “We have secured premises in Mount Street, W.” said Squadron Leader Brant, “where the Pathfinder Club will be situated until we can secure other premises. We shall keep a central register of members and through contact with prospective employers do all we can to help the boys get jobs. A number of big firms are cooperating with us, and we have already place Pathfinders in employment.” The Pathfinders have agreed upon a novel rule for their meetings. Resolutions of the Council may be passed by telephone.